The seventeenth season of free tax preparation services for Boston residents kicked off yesterday with a launch event at Codman Square Health Center celebrated by Mayor Martin Walsh, the Boston Tax Help Coalition, and key community partners. Residents earning $54,000 or less per year can take advantage of the Coalition’s tax site services, which include credit-building help and, new this year, assistance opening secure bank accounts. Last year, the Coalition served more than 13,000 low- and middle-income taxpayers and returned $26.8 million dollars in refunds and credits directly to taxpayers. One of those taxpayers – Zahra Lotfi, a recent immigrant from Afghanistan – told the crowd that the Coalition’s services were especially helpful because it was her first time doing U.S. taxes. Her volunteer tax preparer helped her get back a $5,000 refund and, she said, “We were able to save the money for the new baby.” The baby cooed and squirmed in her father’s lap. 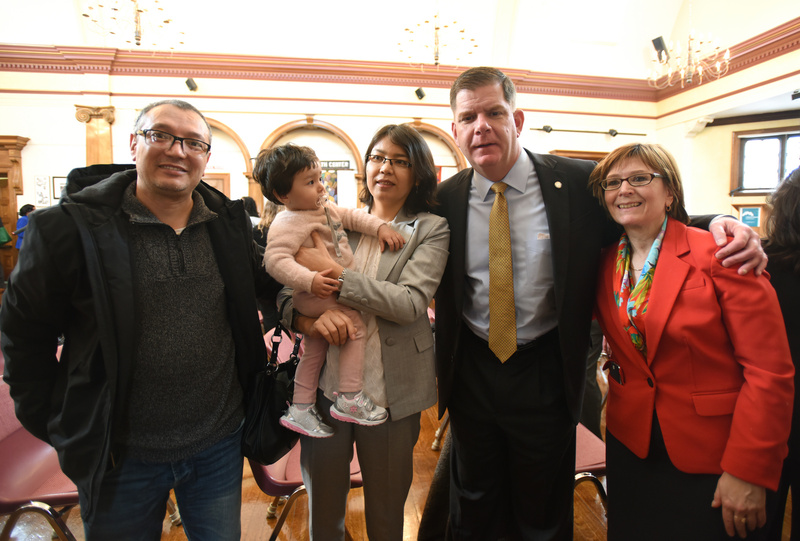 Mayor Walsh with Zahra Lotfi and her family, and Mimi Turchinetz of the Boston Tax Help Coalition. At select sites, the Coalition also offers the Financial Check-Up, a one-on-one session in which a taxpayer can review his or her credit score and obtain personalized credit-building strategies from a trained financial guide. The Coalition will also introduce taxpayers to Bank On Boston, a newly launched initiative that connects residents with banking accounts and financial services that are safe, affordable, and non-predatory. Taxpayers will be able to open Bank On accounts at their tax sites with the help of financial partners. Sandra Cotterell, CEO of Codman Square Health Center – one of the Coalition’s busiest and longest-serving tax sites – underscored the impact the partnership made for Dorchester residents. “The Boston Tax Help Coalition has been a real asset in returning millions of dollars in our neighborhood,” she said. Click here to find a Boston Tax Help Coalition tax site near you.